” Good movies summon up worlds. “Son of Saul,” a great movie and a debut feature by László Nemes, summons up a world we may think we know from a visual perspective we’ve never encountered—the willed tunnel vision of a Jewish worker in a Nazi death camp”, – The Wall Street Journal. In October 1944, Saul Ausländer (Géza Röhrig), a Hungarian-Jewish prisoner in Auschwitz works as a Sonderkommando member, burning the dead. One day, he finds the body of a boy he takes for his son. He tries to salvage the body from the flames, and find a rabbi to arrange a clandestine burial. Meanwhile other members of the Sonderkommando learn about their impending extermination, rise up and destroy the crematorium. Saul keeps focused on his own plan to pay the last honours to a son he never could take care of before. 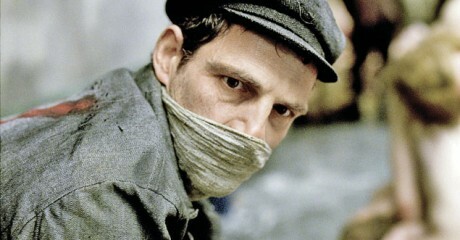 “Son of Saul,” the favorite to win the best foreign language film at the Academy Awards, is a deliberate rejection of less severe Holocaust films. It’s a harrowing depiction of concentration camps’ machinery in action”,”The Time Of Israel wrote. The film premiered at the 2015 Cannes Film Festival where it won the Grand Prix. It has also been selected to be shown in the Special Presentations section of the 2015 Toronto International Film Festival. when is the movie coming to Israeli cinemas?